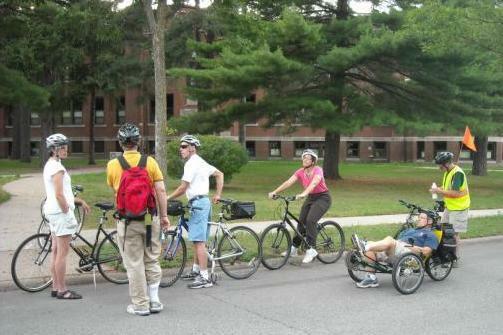 A guided bike tour of historic Wausau learning about the 1908 Grant Elementary School. Wausau, Wisconsin, (population 38,426) was platted and organized as a town in 1852 and incorporated as a village in 1861. The state of Wisconsin granted Wausau a city charter in 1872, and during the next 16 years the population jumped from 2,820 to 9,150 people. It was the Wisconsin River and the virgin pine forests that had first drawn settlers to the area originally known as “Big Bull Falls.” While many lumber companies had ceased to operate by the turn-of-the-century, Wausau continued to flourish. Reasons included its central location, access to the considerable waterpower of the Wisconsin River, and an exceptional group of people who reformed the economy in the early part of the 20th century. Known as the Wausau Group, they did much to build the town and to preserve it. Papermaking followed lumbering as the pine forest began to disappear, and manufacturing industries flourished. To meet industrial needs, the Employers Mutual Liability Insurance Company of Wisconsin began selling insurance in Wausau in 1911 and eventually became one of the largest employers in Marathon County. The Grand Opera House, built in 1899, was replaced by the newer and technically sophisticated Grand Theater in 1927. Restored in 1987 at a cost of nearly $2 million dollars, the theater is owned by the Grand Theater Foundation and leased to the Performing Arts Foundation. The Leigh Yawkey Woodson Art Museum, opened in 1976, also contributes to Wausau’s reputation as the premier arts and cultural community in Central Wisconsin. During Preservation Month each May, the Marathon County Historical Society offers walking and biking tours of historic districts in Wausau. A walking tour of the Andrew Warren Historic District, the first Wausau historic district to be listed on the National Register of Historic Places, was developed and published through the joint efforts of the historical society, the Wausau Historic Preservation Commission, the City Planning Office of Wausau, and the Judd S. Alexander Foundation, Inc. This foundation, which grew out of the timber and lumber industry, was interested because the homes of several early lumbermen are in the district. The Marathon County Historical Museum is housed in the restored home, carriage house, and formal gardens of the turn-of-the-century Yawkey House, which is interpreted to reflect its appearance in 1915. The museum’s library, archives, artifact storage, and other exhibits are housed in the historic Woodson House across the street, which serves as the headquarters of the historical society. Preservation awards are regularly given to merchants and homeowners who have completed significant restoration work. A special award also went to the Wausau Fire Department for its great effort and care in extinguishing a fire at the Yawkey House, including covering treasured artifacts, using a minimum amount of water to prevent further damage to the building, and containing the fire to the third floor, thus preserving a great local treasure.